SUNRISE, Fla. - A south Florida woman is facing murder charges after police say she admitted on Facebook to beating a man, reports CBS Miami. 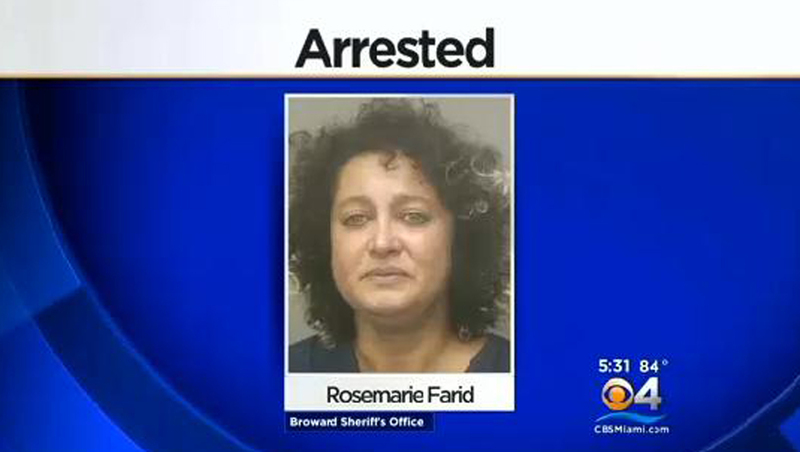 The Florida Sun Sentinel reports 40-year-old Rosemarie Farid, of Sunrise, Fla., beat and robbed her 64-year-old housemate, Donald Gavagni, on June 30th after the two got in an argument over a pet dog. The victim later died due to injuries sustained in the altercation, officers said Monday. According to police, Farid admitted to beating Gavagni and stealing his wallet and phone. She allegedly even told police about a 4-minute video she posted to Facebook on June 30th which specifically mentions the incident. The station reports police responded to a call of a dead male on July 2, according to the complaint affidavit, after a friend who had not heard from Gavagni in three days found him dead in his home. Police reportedly discovered blood in the living room and kitchen, where there were also bloody washcloths in the sink. In the Facebook video, Farid said she beat the victim and then left him in his bathtub. Authorities said Gavagni had a contusion on the top of his forehead and a large laceration on top of his scalp. They also found a pink purse and medication belonging to Farid inside the home. CBS Miami reports Farid was taken to the Florida Medical Center on July 3 after she was involved in an unrelated incident. She agreed to speak with detectives, telling them that she and Gavagni got into an argument on June 30. The suspect allegedly told detectives that she pushed Gavagni in the upper chest and said she believed she had the "desire and ability to kill him" and had "previously fantasized about killing Donald." In addition to her confession, the station reports Farid also told detectives that she posted the Facebook video to her public profile on June 30. She filmed the video, in which she talks about her thoughts on harming the victim and about hitting his head on the ground, in front of the victim's home. "Donny was driving me so insane that I was like delirious from the fighting. I couldn't take it anymore," Farid says in the recording. "I was having fantasies about stabbing him in the neck with a very sharp little knife - I knew I had to get out." The suspect goes on to explain how she believes she is capable of killing Gavagni, saying, "I am mentally disabled.... I know that I can become pretty violent." Farid continues, "I left, but before I left, I took all the money out of his wallet and I stole his phone - and I bashed his head on the floor a couple times." She states in the video that she did it because he killed his dog. The complaint affidavit states Farid "appeared proud of the video" and even invited people to view it on Facebook. She is being charged with premeditated murder.